New Zealand has a worldwide reputation for being a welcoming and safe destination. New Zealanders are renowned for their honesty, friendliness, and openness. to the countries of the South Pacific Islands, Asia and Australia creates a world of opportunities for our students. New Zealanders and visitors have great access to a wide range of sporting facilities, such as golf courses and other cultural and recreation centres. New Zealanders’ adventurous spirit is contagious and with an abundance of natural beauty scattered across the North and South Island, it’s hard to resist the local outdoor sports. New Zealand lies in the South Pacific to the east of Australia and consists of both the North and South Islands, and a number of smaller islands. 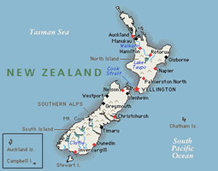 New Zealand is an English-speaking country with a population of approximately four million people. The influence of Pacific Island, Asian and European immigrants during recent times has helped shape New Zealand into a vibrant and diverse multicultural society. With a low population density, all New Zealanders and visitors have great access to a wide range of sporting facilities, such as golf courses, and other cultural and recreation centres. New Zealand is world famous for the variety of its beautiful environment. The diverse scenery includes impressive mountainous areas, fertile farmland, as well as beautiful coastlines with stunning sandy beaches. New Zealanders and visitors enjoy the wonderful environment in many ways, ranging from relaxing bush walking and soaking in thermal pools, through to adventurous outdoor activities including hiking, mountaineering, kayaking, etc.The climate is the reverse of the northern hemisphere. Summer months of December – April are warm, while we do get colder weather in the winter months of July – November.